To most of us Rudolf the Red-Nosed Reindeer has always been an essential part of our Christmas folklore and tradition, but Rudolf is in fact a twentieth century invention whose creation can be traced 1939 when the Chicago based Montgomery Ward Company asked one of their copywriters, 34 year old Robert L. May, to develop a Christmas story they could give away in a booklet form to shoppers as a promotional gimmick. 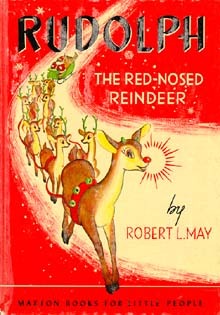 May had a talent for writing children’s stories and poems so drawing from his own “ugly duckling” background, (He was often teased and bullied as a child for being small ) came up with the idea of an underdog ostracized by the reindeer community because of his abnormality: a glowing red nose. May considered and rejected several names before deciding on the name of Rudolf. He then proceeded to write the story in a series of rhyming verses testing it out on his 4 year old daughter as he went along. Although his daughter was thrilled with the story, May’s boss was worried that people would associate a reindeer with a red nose to drinking and drunkards and would be unsuitable for Christmas, but later overcame his hesitancy and approved the story. Montgomery Ward distributed 2.4 million copies of the Rudolf booklet in 1939 and although war-time shortages limited the printing for the next several years, by the end of 1946 a total of 6 million copies had been distributed. Since May had created the story as an employee of Montgomery Ward they held the copyright and May received no royalties for his story. May’s wife died the year that the Rudolf story was released. Because he was deeply in debt from medical expenses, he convinced Montgomery Ward to turn the copyrights over to him in January of 1947 and May’s financial security was insured. “Rudolf the Red-Nosed Reindeer” was printed commercially in 1947 and was released in theaters as a 9 minute cartoon later that year. The “Rudolf Phenomenon” really took off when May’s brother-in-law, songwriter Johnny Marks, developed the lyrics into a song that was recorded by Gene Autry in 1949, sold 2 million copies, and became one of the best-selling Christmas songs of all time, second only to “White Christmas”. The television special about Rudolf narrated by Burl Ives was produced in 1964 and remains a popular staple of the Christmas season today.